Module, Fiber Option, LC, OM3, Duplex | Avcomm Solutions, Inc.
LC/LC OM3/OM4, duplex fiber optic snap-in keystone module is suitable for multimode fiber (MMF) 10G or higher bandwidth applications. 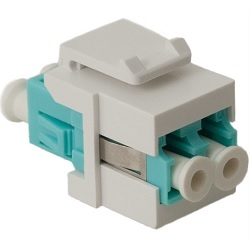 This small form factor (SFF) footprint reduces space or port by 50% over the larger fiber optic connectors such as SC, ST and many others. 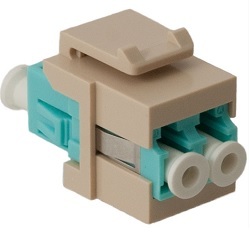 These snap-in keystone modules provide mating capability for fiber optic patch cables with LC connectors in all compatible faceplates, blank patch panels, adapter plates, surface mount boxes, and Elite multimedia outlets.